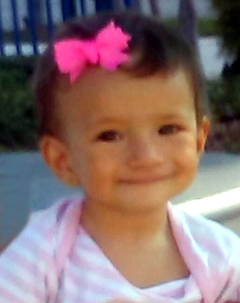 Miranda Nicole Sanchez, 10 months old, went to be with the Lord on Friday, September 7, 2018 in Fort Worth, Texas. Funeral Mass for Miranda will be 11:00a.m., Tuesday, September 11, 2018 at St. Josephs Catholic Church with Father Peter D’Sousa officiating. A rosary will be held at 6:00p.m., Monday, September 10, 2018 at Calvillo Funeral Home and Chapel. Miranda was born October 19, 2017 in Lubbock to Gerardo Sanchez and Victoria Hernandez. She was a sparkle of joy that shined brighter than any princess and her smile and personality will be something that will live on in the memory of those who loved her so. She cherished her Elmo doll but most of all she had an unending love for her family. She is survived by her parents Gerardo Sanchez and Victoria Hernandez; a brother Tomas Guillen; grandparents Mario and Maria Sanchez, all of Lubbock. She is preceded in death by her grandfather Ruben Liscano (2012).